The world of perfume can often be a mystifying place. There is always a lot going on and with 1,000 + launches per year, there’s a heck of a lot to sniff out there. When one is new to this beautiful and fragrant world the volume of stuff and the science behind it can often be daunting, if not utterly perplexing, making room for a whole raft of unanswered questions that simply beg for information. Do perfumes smell different on different people? They do and they don’t. For the most part a perfume will smell pretty much identical from person to person however, differences in skin types will have an impact; for example, dry skin tends to retain fragrance for less time than oilier skin. A person’s natural body odour can influence the smell slightly. What’s the deal with masculine, feminine and unisex fragrances? Marketing drives the perfume industry and generally speaking, consumers feel more comfortable knowing whether a perfume is for men, women or both, therefore perfumes are marketed as such. The truth however, is very different and in reality there is no such thing as gender in perfume, after all fragrances do not have lady or man parts and can be worn by anyone – all that’s required is a little confidence. My advice is to smell as much as you can and wear what you like. If you want to experiment then go for it (fragrant gender bending is always fun; ladies can kick off with Guerlain’s Habit Rouge and the gents can go to YSL’s Nu as a starting point), or if you’d rather stick with labels, then that is fine as well. The only rule in perfume is that there are no rules. Not necessarily! Variety is one thing that is not scarce in the perfume industry and it would be fair to say that there are bad perfumes at the higher end of price scale and great ones at the lower end of the spectrum, and visa-versa. For a truly luxurious and opulent fragrance experience one can look to Omani-based Amouage (Gold Woman and Interlude Man are particularly phenomenal) or for cheap thrills, one simply cannot go wrong with Cacharel. 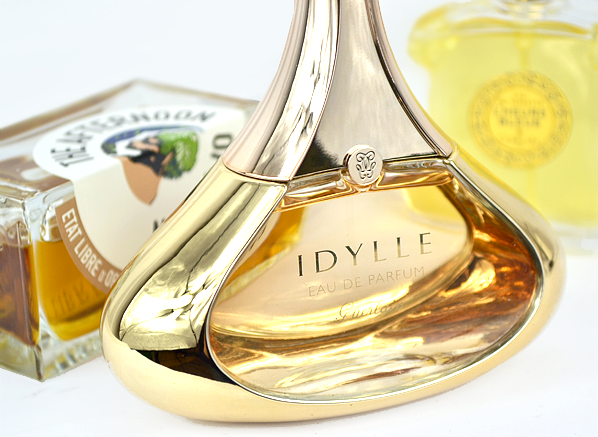 There simply is no room for snobbery in the perfume world, smell freely and smell all. Sillage (pronounced ‘see-yazh’) essentially refers to the projection of a perfume. It is the trail of a fragrance that notifies people of one’s presence and lingers long after one has left a room. The amount of sillage a perfume has, much like the amount of sillage an individual prefers, varies completely. Some perfumes, such as Thierry Mugler’s Angel and Alien have whopping sillage that can be practically smelled from space, whereas Guerlain’s Idylle and Givenchy’s Dahlia Noir L’Eau both have a much more intimate sillage. Personally, I love my sillage big and bold, but you may differ! What’s the difference between Eau de Toilette and Eau de Parfum etc.? The differences between Eau de Toilette (EdT), Eau de Parfum (EdP), Parfum (or Extrait) and Eau de Cologne (EdC) are a matter of concentration. Perfumes that have a higher concentration of perfume oil are likely to be stronger and last longer on the skin, whereas those with a lower concentration will not be as present, nor will they remain on the skin for as a long time. The lightest of the bunch, EdC, contains approximately 2-4%* perfume oil amongst the alcohol and/or water, whereas EdT and EdP are stronger in 5-15%* and 15-20%* concentrations respectively. Parfums (also called ‘Extraits’) are the strongest of the bunch and tend to carry a concentration of approximately 20-30%*. Due to their higher concentration, Extraits tend to last much longer than Eau de Toilettes, or even Eau de Parfums however, they wear much closer to the skin and are less diffusive, creating a more intimate experience that is heightened by the fact that they are usually dabbed straight on to the skin. There’s so much perfume out there, where do I start? Anywhere you like! Sniff as much as you can in department stores and perfume boutiques (or order samples/sample sets online), read blogs and websites such as Now Smell This and Basenotes. Find out what it is that you love and just keep smelling. Eventually, yes. All perfumes are given a shelf life but they can last a relatively decent amount of time if they’re stored properly, after which they would start to slowly degrade starting with the volatile top notes. Sunlight and extreme temperatures are a perfume’s worst enemies, so it is best to keep your scents stored in a cool, dark place. What’s better, natural ingredients or synthetic ones? Again, this really depends on your preference. Most perfumes are a blend of natural ingredients, i.e. oils and absolutes extracted from flowers and woods etc., and ‘synthetic’ aroma chemicals that can be used to either recreate something that is not extractable from nature, or give lift and presence to a composition. Natural ingredients tend to be a bit more volatile and can also be subject to changes in quality due to environmental influences, hence the need for synthetics to fix them into place. All natural fragrances do exist and they often come across as more one-dimensional and less present than those with synthetics. A balance of both makes for a more fully rounded experience. What’s the deal with fragrance families? Narciso Rodriguez for Her is a floral oriental (floriental) and Amouage’s Interlude Woman is a fruity chypre. There’s room for a lot of mix and match, and it’s immense fun getting to know the many different varieties within each family. Can I layer my perfumes? Many fragrances come with ancillary products such as shower gels and body lotions to create a more enveloping experience of scent. These are great to use in conjunction with one’s favourite fragrance to make it longer lasting and a bit louder. Some fragrances, such as the ones from Jo Malone, are created to compliment each other when layered. Many others aren’t and layering them together can result in interesting effects, that aren’t always that successful and are definitely not what the perfumer intended. That said, perfume is about fun and experimentation so you should do whatever you fancy! Is it best to have one perfume as a signature scent or a variety? This is entirely your choice. Some people will remain faithful to one fragrance throughout their entire life, the benefit of this being the fact that it very much becomes ‘their’ fragrance and people are likely to associate the smell of the scent with that person, which is lovely. Others however, and you can count little old me into this category, are completely adulterous when it comes to fragrance, flitting from one to another on a regular basis. A good way to enjoy fragrance is to build up a capsule fragrance wardrobe with a number of perfumes for different occasions and seasons. One doesn’t need a huge number to achieve this and can simply pick one for spring, one for summer and so on, and so forth. The more the merrier, I say! Do you have any burning fragrance questions? Ask them in the comments box below! * Source: The Perfume Bible. Josephine Fairley and Lorna McKay. Kyle Books. This entry was posted on Thursday, October 9th, 2014 at 9:27 am and is filed under Candy Perfume Boy, Fragrance. You can follow any responses to this entry through the RSS 2.0 feed. You can skip to the end and leave a response. Pinging is currently not allowed. Hi – I’m a total newbie trying to expand my understanding (and my selection) of fragrances – and completely out of the blue this morning my husband asked me if I’d find him an aftershave. He’s never worn one before so it came as a total surprise. I have no idea where to even start and I don’t want to spend a lot on something that he won’t wear – I’m thinking something traditional, and ‘manly’ in a sample size that he could try for a few days (we can work on getting him to try something a bit more daring a bit further down the line!). He’s 50 years old – can you suggest some starter Eau De Midlife Crises options for me to source, please? In the meantime I will give him your (excellent) ManFace guide to read through and see what he thinks he might like! Hi Siobhan! Thanks for your comment. For something manly and traditional, you cannot go wrong with Dior’s Eau Sauvage. This is a sparkling citrus fragrance with leather-y, hay-like nuances that is manly without being overtly butch. Think James Dean in Rebel Without a Cause and you’re on the right track. So glad you enjoyed the ManFace guide!